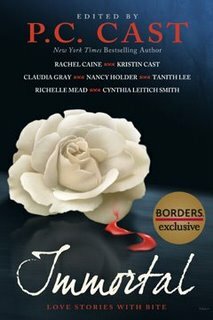 Immortal: Love Stories With Bite is a collection of short stories about vampire romance written by some of todayâs most popular young adult authors. A story about a love triangle between a girl, a vampire and a ghost. This story wasn’t exactly bad but it wasn’t good either, it was “blah.” It was ok for a short story, nothing special though. Ugh, where to start? Just like the House of Night series she tries WAY too hard to sound teen friendly, like a cool hip teenager. It is outlandishly over the top, no teen actually speaks like that. It is cheesy and irritating, Kristin really needs to tone it down. Being in touch with teens is one thing but sounding like that sad middle-aged mom trying to fit in with her teen daughterâs friends is another. As for the story itself, awful. The author took every overdone, clichÃ© story idea and threw it into one story. She also put way too much random info into the story and it got to the point where you were like “wtf?! why did that happen, how did that happen” every few sentences. It was the type of storyline that needed to be a novel so that everything could be explained, instead its a short story that doesn’t make sense and doesn’t flow smoothly. It wasn’t much of a short story at all, just random nonsense thrown together with no meaning whatsoever. Excellent! I haven’t read the Morganville series but now I want to. The author’s tone was great, the story was interesting, plus clear and solid and it made sense. It was what a short story should be, a whole story in just a few pages, not too much but not too little either. A tale about a clever young woman meeting a very lost and misguided young vampire. I thought the story was very well written. A new interesting look on vampires. I enjoyed it. Another excellent, well written story. Showing a different kind of love and a different kind of vampire world. Instead of the dark brooding romantic vampires, you get the evil apocalyptic ones. A great read with an admirable message. A story about a vampire on the run from her kind and the human boy that helps her. I really liked this one. I almost always love vampire stories where the vampires are known to the world. I loved this one. It was a great story about a strong woman doing what she needs to do to make herself happy.Â It was also the only story that wasnât set in the present which was a nice change of pace from the other stories. Overall the book was alright. This book is worth picking up at your next library visit, not one I would run out and buy though. There were a few wonderful stories in there but like any anthology there were some that were atrocious. This is for sure a young adult book, none of the stories featured anything that could even be considered PG-13.